Man, this has been one LONG arc. I had actually planned on ending it a few comics ago, but after some thought I decided that you all deserved better. This entry was posted on Friday, December 9th, 2011 at 12:00 am and is filed under Comics. You can follow any responses to this entry through the RSS 2.0 feed. Both comments and pings are currently closed. nope, its a draw, Trolls dont consider pain failure + neither of them did tell the other to take over, so there was noone who gave in. To me, at least, it looks like Locke won. 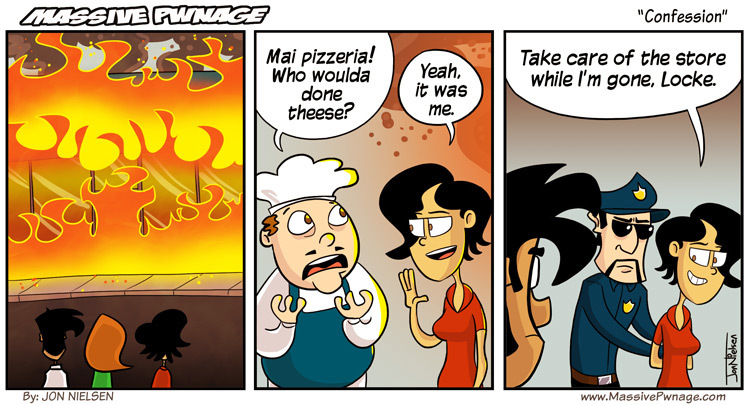 Wait, or did she burn down the chef’s store? so she got out of the fire.